The aftermath of the deadly bomb attack on Jolo Cathedral in January. A terrorist believed to be involved in the bombing of Jolo Cathedral was one of two Abu Sayyaf militants killed on Sulu Island. The military today (Tuesday, April 9) reported that the pair were killed during law enforcement operations near the town of Patikul yesterday. Colonel Gerry Besana, speaking for Western Mindanao Command, said government troops, led by Lieutenant Colonel Alaric Avelino delos Santos, clashed with some 40 Abu Sayyaf fighters under Almujer Yada at about 3.30pm. The 40-minute firefight “supported by indirect fires and close-air support” resulted in the death of Barak Ingog, who has been tagged by military intelligence as one of the facilitators of the deadly bombing of the cathedral on January 27. Col. Besana said Ingog was among those who facilitated the entry of bombers and transported two improvised explosive devices to the place of worship. Following yesterday’s clash, soldiers recovered an M16 rifle and personal belongings of the terrorists from the scene of the encounter. Another Abu Sayyaf militant, identified as Nasser Sawajaan, a nephew of group leader Hatib Hajaan Sawadjaan, was also killed during the encounter. “Three of our troops were slightly hurt by shrapnel but they are now fine,” Brigadier General Divino Rey Pabayo Jr, commander of Joint Task Force Sulu, said in a statement today. 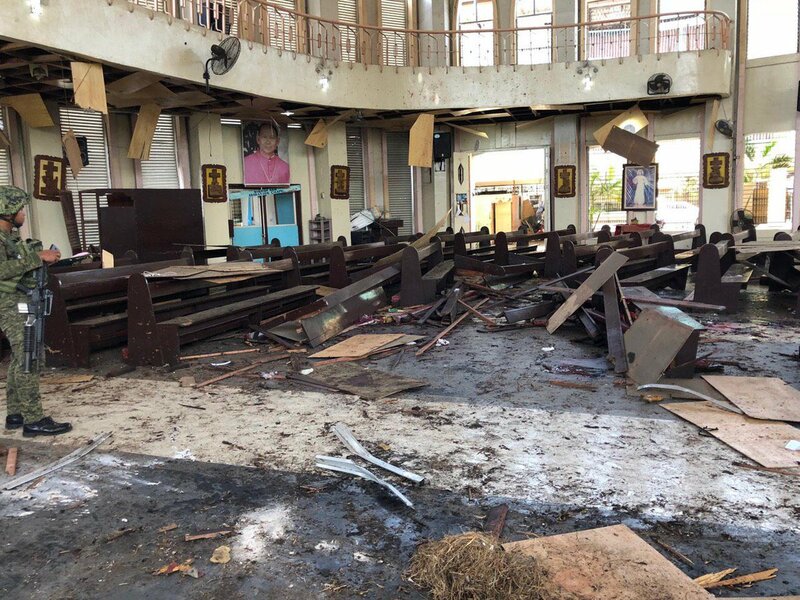 As we reported, some 24 people were killed and scores of churchgoers were injured when two people — believed to be a married couple — set off two bombs inside and outside Our Lady of Mount Carmel Cathedral in Jolo in January.